GALION — A proposed Multipurpose Recreational Trail in the city of Galion has a better chance of getting off the ground thanks to the possibility of local grantrom the Freese Foundation. The idea for the trail started in 2014, but has been met with financing obstacles at every turn. The city had applied for a TAP grant through ODOT in 2015 and 2016, but was not approved. Then in 2017, the city applied for a Clean Ohio Trails grant offered through the Ohio Department of Natural Resources, but once again the application was denied. The city is working hard to find the funding for this project and has no intention of using city money to do so. With that in mind, the plans for the trail have been downsized and will be completed in phases as funding becomes available. The first attempt at funding the scaled-down project may come by way of a grant from the Freese Foundation. The Egbert M. Freese Foundation annually supplies grants to the city that must be used for the purpose of maintaining or establishing Galion parks and recreation projects according to the specifications of the Freese will. It is not available for any other public use. Recent projects that have come to benefit Galion as a result of Freese funding include the Splash Park located at East Park and the shelter at Amann Reservoir. Galion City Council was recently given the first look at upcoming Freese funding ideas at last week’s meeting. While the funding for the recreational trail is the largest request at approximately $300,000, the amount is half of what was originally being proposed. With plans for the trail being divided up into phases, the project would begin “in the middle”, in the portion of greatest benefit to Galion residents initially. The starting point for the first phase of the trail begins near the city’s water treatment facility located on Hosford Road and would extend along the Olentangy River to stop where it will intersect Bucyrus Road. In the future — once further grants and funding are approved through other channels — the trail will run from Ammans Reservoir north to the Galion City Schools campus, across State Route 598 to Heise Park. As far as a timeline for the trail project, Echelberry said the city is hopeful that site prep would be started sometime this year, with completion of this portion of the project in 2019. The beginning phase of a proposed multipurpose recreational trail for the city of Galion is pictured on this map. 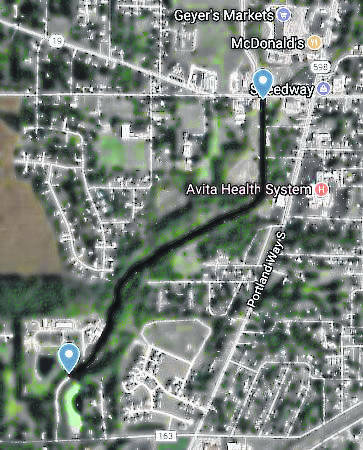 The project is being sent to the Freese Foundation for funding approval and would possibly be completed sometime in 2019.
https://www.galioninquirer.com/wp-content/uploads/sites/38/2018/04/web1_Overtop-view.jpgThe beginning phase of a proposed multipurpose recreational trail for the city of Galion is pictured on this map. The project is being sent to the Freese Foundation for funding approval and would possibly be completed sometime in 2019.